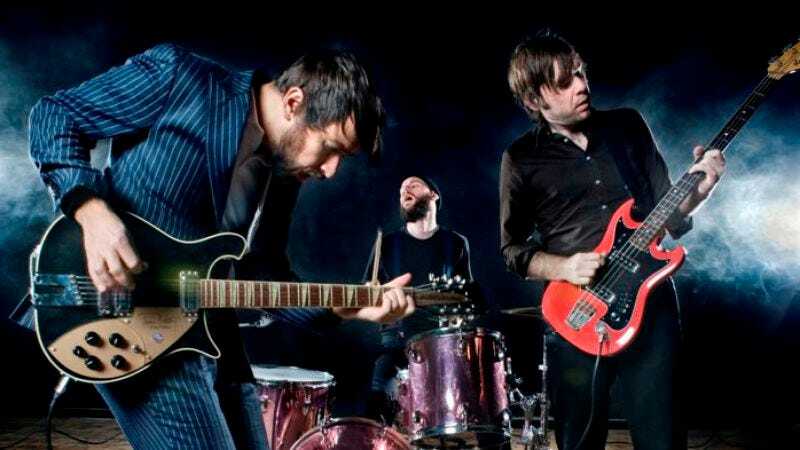 Peter Bjorn And John whistled their way onto the scene back in 2006 with “Young Folks,” and immediately solidified a place in the collective pop pantheon. To date, about a million other bands have covered “Young Folks,” including Nena, Pete Yorn, The Kooks, James Blunt, and countless YouTube crooners. For their part, though, Peter Bjorn And John aren’t strangers to the cover world themselves. Guitarist Peter Moren played quite a few covers on tour for his solo debut in 2008, and the band as a whole has quite a few covers under its belt. It’s always a good idea for every band to have a solid cover in its back pocket to pull out when encores get long or shows get slow. The A.V. Club talked to drummer John Eriksson, before Peter Bjorn And John’s show this Saturday at the Troc, about his favorite covers and what makes a tribute song such a success. The A.V. Club: Why do covers? John Eriksson: The difference between playing in a real band and a cover band is not that big. We are all pirates who steal stuff from others, and it’s not the easiest thing in the world to write a good song, so sometimes a good cover is more relevant than a new song. AVC: Everyone starts out playing covers, right? JE: All three of us got a lot of our musical training from playing music made by other people. Before our band happened, Peter was playing with a ’60s music cover band in Stockholm called The Grand Old Softies. Bjorn and me also did some memorable appearances in that orchestra, like playing a weird party at the finance department of the Swedish government. The night ended with the payment being handed to us under the table. Personally, I lost my cover virginity at the age of 15 with some sort of after-ski band up in the North of Sweden, playing songs by Tom Petty, Jackson Five, and the Swedish Bob Dylan, Tomas Ledin. Some years later, I was also in a huge cover band called the Swedish Radio Symphony Orchestra. A lot of the music out there is covers, and I think it’s the best way to learn how to play and how to make your own music. All jazz standards are in the backbone of every jazz musician and, well, take The Beatles for instance. They started off as a dirty cover band, and after learning the basics of blues and how to get laid in Hamburg, they could write some pretty decent songs. AVC: What are your favorite covers? JE: One is The Nerves’ “When You Find Out.” We’ve been playing this song almost since we started the band. All the songs on The Nerves EP are fantastic, and we used to listen to it in the car when we went to play at some random pizzeria in Sweden. One day we felt like we just had to play this song live, and we still play it. [Recently] we finished our live set with it, and nowadays it almost feels like it’s our own song. Also, I think it was the best song we had in our repertoire about 10 years ago, and our new album, Gimme Some, is the closest we have ever gotten to this kind of stripped-down power pop. So I guess this song is one of the main cornerstones of Peter Bjorn And John. I think you should play covers by people who aren’t rich and successful. We are more than happy to let Dan Treacy from T.P. get some performing rights money rather than, for instance, give it to Gene Simmons. The first time we ever played this song was when we recorded it as a B-side on an early EP in 2004. I’d never heard the song before, and since we just did one take, you can hear that I’m trying to figure out what’s coming next. Sometimes that’s the best way to play a cover. When we recorded our version of The Strokes’ “Is This It” some months ago, we didn’t want to do something clever or smart. We just tried to play the song as simply as possible, and it’s not that far from the original, really. When you do a remix, you can and should treat the song as a laboratory rat and just go crazy with all your power tools, but when you make a cover you could be more gentle. JE: Sometimes a cover becomes better than the original. I really love the Sheriff version of our song “Start To Melt.” They named it “Words Round Your Waist,” and it is almost Japanese in its minimalistic calmness, and the way they changed the lyrics around like a jigsaw puzzle is kind of beautiful. Magnus Granberg, who plays piano and sings [in Sheriff], now as a new project called Skogen—the forest—and it’s amazing. AVC: Do you have any covers you’d like to know but just don’t yet? We and all the other bands and artists are just reinventing the wheel over and over again, but by playing around with music history you sometimes find stuff that nobody’s found before, maybe.